Victor Jory's burly physique served him well in the Coast Guard, where he excelled in boxing and wrestling. His sinister appearance and distinctive voice often cast him as the heavy. He appeared on the radio series Dangerously Yours. All the great ones are gone. 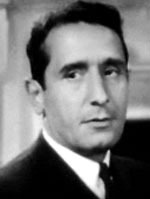 Victor Jory (November 23, 1902 – February 12, 1982) was a Canadian-born American actor of stage, film, and television. He initially played romantic leads, but later was mostly cast in villainous or sinister roles. Victor is remembered for his roles as malevolent Injun Joe in The Adventures of Tom Sawyer (1938), Jonas Wilkerson, the opportunistic overseer of the slaves at Tara in Gone with the Wind and as Lamont Cranston, aka 'The Shadow', in the 1940 serial film The Shadow. He also portrayed Oberon in Max Reinhardt's 1935 film adaptation of Shakespeare's play A Midsummer Night's Dream. He co-starred in seven Hopalong Cassidy films between the years 1941 and 1943, usually cast in the role of a villain with the exception of his role as a broad-shouldered lumberjack in the film Riders of the Timberline (1941). e starred in the radio series "Dangerously Yours" beginning in July, 1944. The series was retitled "Matinee Theater" in October, 1944 and ran through April, 1945. Each episode was a dramatic reworking of famous literary works. The first episode dated 7/2/44 was "The Highwayman", a dramatic interpretation of the Alfred Noyes poem. In 1946 he narrated "Tubby the Tuba" for children, which was inducted in 2005 in the National Recording Registry and also introduces the orchestra to young listeners. The story tells of a tuba who doesn't fit in. He also narrated "Bumpo the Ballerina", whose title character is an elephant. From 1959 to 1961, he appeared with Patrick McVey in the 78-episode syndicated television police drama, Manhunt. Jory played the lead role of Detective Lieutenant Howard Finucane In 1957, Jory was cast in the role of the Southern Baptist pastor George Washington Truett of the First Baptist Church of Dallas, Texas, in the episode "Lone Star Preacher" of the syndicated religion anthology series, Crossroads. In 1962, Jory was cast as Deacon Lee in the two-part episode, "Policemen Die Alone" of Leslie Nielsen's ABC crime drama, The New Breed. That same year, Jory guest starred as Mike Dahlback in the episode "Ride to a Fall" in the NBC modern western series, Empire, starring Richard Egan as rancher Jim Redigo. He also played Helen Keller's father in The Miracle Worker, for which his costars Anne Bancroft and Patty Duke won Academy Awards. In 1964, along with actresses Coleen Gray and Susan Seaforth, Jory testified before the United States Congress as part of "Project Prayer," arguing in favor of an amendment to the United States Constitution to restore school prayer, which the United States Supreme Court struck down in two decisions in 1962 and 1963. In 1977, near the end of his career, Jory guest starred as an aging Federal Bureau of Investigation agent in James Garner's The Rockford Files episode, "The Attractive Nuisance."